In her influential examination of the Epistemology of the Closet, Eve Kosofsky Sedgwick has illuminated the ways in which individuals are assignable to—or constrained by—a “binarized identity” of homo/heterosexuality that is “full of implications, however confusing, for even the ostensibly least sexual aspects of personal existence.”2 She contends that since its establishment in the late nineteenth century, this “reductive binary” has caused a “crisis of homo/heterosexual definition” that profoundly affects self-identity in our modern culture.3 Sedgwick feels that the widespread belief in a diametrical conception of sexuality is misguided and has resulted in a disregard for historically significant and “unexpectedly plural, varied, and contradictory” possibilities for sexuality and gender.4 In recent years many gender theorists have joined Sedgwick in critiquing the function of such inhibiting thinking in notable cultural realms such as art, history, and literature. 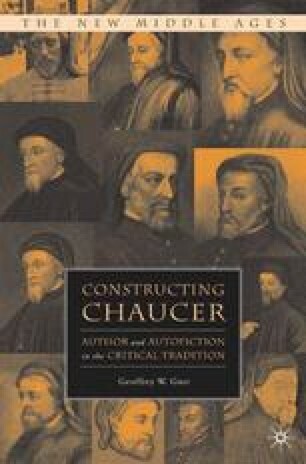 Yet as Karma Lochrie has shown, “reductive” binary thinking continues to taint contemporary scholarship, where accepted sexual and gender norms remain “potent” forces that commonly relegate variant sexualities and gender configurations to the “excluded penumbra of heteronormativity.”5 This exclusion is evident in Chaucer Studies, and the current chapter seeks to encourage further thought regarding the “normality” of key “definitional binarisms” found in criticism of the Wife of Bath and Pardoner. Sexuality is an unstable construct in our societies, and hence produces endless textual work. Such an awkward issue has continually to be revisited, disavowed, rediscovered, reaffirmed. Closure, by definition, is always potentially unsatisfactory; even conservative texts are often to be found pushing representation to a breaking point where contradiction cannot plausibly be contained. In the face of such a performance, some audience members will retreat into conformity, while others will entertain more radical possibilities. These texts were, and are, sites of struggle; and their varying re-presentations are that struggle.